Thile (last name rhymes with “McFeeley”) is a mandolin wunderkind who was playing with the bluegrass trio Nickel Creek at the age of eight, had a solo record contract at the age of 12, won a Grammy Award at the age of 16, and received a McArthur “Genius Grant” fellowship at the age of 31. Now at 32, Thile has recorded his first album of classical music, a CD of Sonatas 1 and 2 and Partita #1 for Solo Violin of J. S. Bach. But the crossover into classical music is no ego-tripping flight of fancy; Thile was turned on to Bach at the age of 16 when grandparents gave him records of the Brandenburg Concertos and the Goldberg Variations. With no formal musical training, he taught himself to play Bach’s solo violin works on the mandolin (whose strings are tuned identically), and has spent half his life exploring this music. This concert blends his passions of classical music, bluegrass, and original compositions, all filtered through his voice and his mandolin. The recital was organized around Bach’s Sonata #1 in G Minor for Solo Violin, BWV 1001 and the Partita #1 in B Minor, BWV 1002 (hence the title Bach-toberfest). The Sonata served as “tent poles” for the program, with each of the four movements— Adagio, Fuga: Allegro, Siciliano, and Presto intermingled with bluegrass tunes and original works, and a complete performance of the Partita sandwiched in the middle. Thile called some of the works to be played from the stage, and tied the sets together with his boyish, irreverent, self-deprecating charm. Thile’s Bach playing is revelatory (you can hear the complete first sonata here). He has chops to burn—he can tear through the final Presto with impressive speed and accuracy while molding phrases and lines with the skill of Chet Atkins, Eric Clapton, or Sviatoslav Richter. Thile can also sustain a musical line with lovely shape in the exquisitely slow Adagio and Siciliano, played as written without mawkish trilling. The pseudo-counterpoint of the Fuga was delivered with clear distinction of top and bottom voices. His playing is rigorous—many a violinist will omit repeats from performances of these works, but Thile played every last one, often inflecting the repeats subtly differently. He demonstrated lovely dynamic contrasts, often playing echo figures softer, but in at least one Double, picking up speed, momentum, and volume to end on a flourish. And the Partita had an interesting, idiosyncratic approach to rhythm— the Allemande with Double and Corrente offered a steady stream of clock-like eighth notes without lapsing into mechanical boredom (the Corrente-Double was another impressive high-speed torrent of notes), and the groupings in the Sarabande with Double and Tempo di borea with Double struck me as the phrasing of a bluegrass fiddler rather than an Historically Informed violinist. It worked astonishingly well, and a performance of these two works would have been a fulfilling enough evening. However, Thile surrounded the Bach with a range of more recent pieces. He segued from the opening Adagio into the Louvin Brothers’ song, “Broadminded.” He undercut the Louvins’ admonishment that “the word broadminded is spelled S-I-N” with an original mandolin part that was loaded with jagged key changes, weird leaps, virtuosic passagework that seemed to owe as much to Bach’s violin music as bluegrass fiddle tunes, and drawn out passing-tone dissonances that Bach or Schubert would have loved. Thile followed with an excerpt from the third movement of “The Blind Leaving the Blind,” from his first CD with Punch Brothers, then tore through the Stanley Brothers chestnut “Rabbit in a Log,” selectively slowing down some of the riffs to show their structure, then speeding back up to blistering velocities. The Bach Fuga was followed by “Stay Away,” an original song that showcased Thile’s singing. He uses a pleasant light tenor and falsetto, shows just as much range and control with his singing as with his playing, and can turn a phrase with stark expressiveness. In Fiona Apple’s “Fast as You Can,” he began with a variety of sound effects that reminded me more of modernist string techniques, like high harmonics or striking of the strings with col legno percussiveness. Then, taking his fret hand grip off the strings, the weird percussive figurations became a series of driving riffs that accompanied a Paul Simon-esque vocal. In compliance with regulations handed down by the International Association of Solo Performers (a droll joke, accompanied by the wry observation that when he asked people who performed solo to raise their hands, a lot more hands went up in the balcony than the floor), Thile played his obligatory Civil War song. “Richmond Is a Hard Road to Travel” sounds like a Tom Lehrer take on the Civil War, bending the traditional “Jordan Am a Hard Road to Travel” to a dryly witty recounting of incompetent Union generalship in the first three Virginia campaigns, naval ironclad battles, and the emancipation of the slaves. These were interspersed with fiddle figurations of progressively escalating speed and complexity. The Partita was followed by his original song, “If You’re Gonna Leave Me (Set Me Up with One of Your Friends),” with more droll humor about getting dumped, then “Garden of Eden,” which mingled a kind of Celtic Bach with bluegrass verses and choruses. A direct segue to the Bach Siciliano offered a striking and surprising change of mood. Then another original song, “Here and Heaven,” offering a softer, more melancholy side. The blazing Presto concluded the program, but Thile returned to the stage for a hilarious encore, “Song on the Mandolin.” A lyric in the chorus, “There ain’t too many folks who can play too many notes on the mandolin” seemed to more or less sum up the evening. Thile’s self-presentation deserves some comment. His strategically tousled hair, rakishly opened necktie and dress shirt (albeit tucked into his pants, unlike his bluegrass shows), his colorful anecdotes and self-deprecating humor took much of the stuffiness out of a classical recital. He wasn’t afraid to explain the structure of the Partita #1, poke fun at the mysterious names of the dances, and invite anybody who knew the steps to the courtly dances to join him on the mostly bare Sanders Theatre stage (a dangerous proposition in an early music town like Cambridge, though nobody took him up on the offer). And yet, he used strategic changes in lighting to focus audience concentration during his performance, and wasn’t afraid of playing at a Segovia-like whisper. As a result, the audience was loose and relaxed, but there was no coughing, shuffling of feet, opening of candy wrappers, or cell phone ringtones (mostly) through every repeat of the Partita, and the capacity crowd erupted into vigorous applause at multiple junctures. As Thile plays, he also clearly gets transported by the music, and indulges in a wide variety of contortions, stomping, hip swiveling, and grimaces as he plays. This kind of theatricality can be fun to watch, though the one problem is that some of the mandolin lines got distorted, some of the execution thrown off by twisting at the wrong time. It was an audacious program, executed brilliantly. I look forward to volume 2 of the Sonatas and Partitas, and I wonder if some of us in the classical music world can learn something from this kind of presentation. 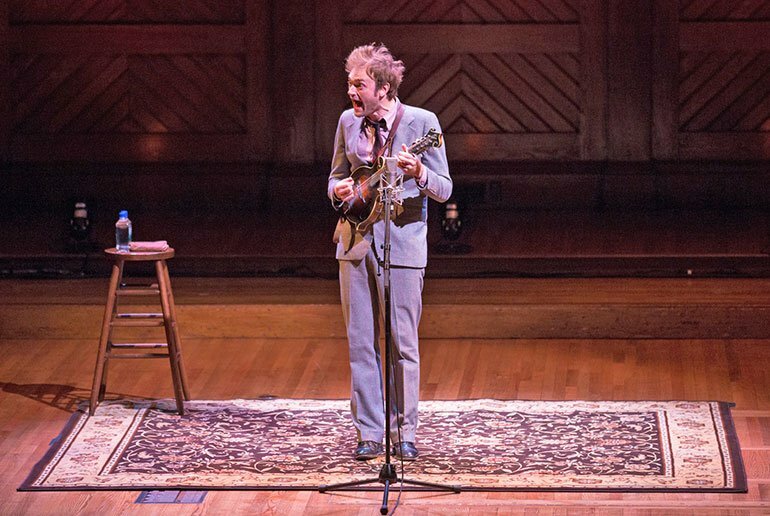 Thile returns to the road, going up and down the East Coast in the next two weeks (his tour schedule is here). The Celebrity Series returns on Sunday October 27th with David Finckel and Wu Han at Jordan Hall, then Wynton Marsalis and the Lincoln Center Jazz Orchestra at Symphony Hall.